Your Farm, Your Farmers, Your Food. Riverhill Farm had its start in 2001. Thanks to tremendous support for our endeavors from our community, today our farm produces a diverse mix of organic vegetables and fruits on ten acres, including many heirloom and specialty varieties. Many of our customers appreciate the farm for the beauty of the place itself, the last level terrain before a 1500 ft. drop into the canyon of the Yuba River. Find out more About Our Farm. We are currently accepting sign ups for our 2019 Friend of the Farm Card! We offered CSA weekly subscription boxes for six years, and this is our 7th year offering a different arrangement as an alternative to getting a weekly CSA subscription box. 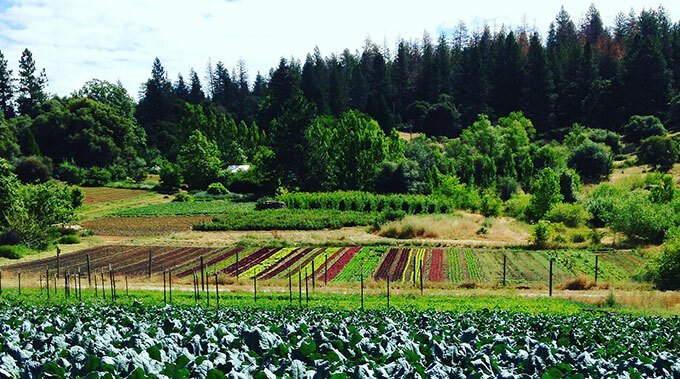 Buy a Friend of the Farm Card in one of three values before the deadline, and receive 10% value added to your card to purchase our produce at the Nevada City Saturday Farmers’ Market and at our farmstand at the farm. Through buying a Friend of the Farm Card, you directly support the farm with critical early season capital and you can use your card like a debit card to purchase what you want when you want it from our weekly selection of seasonal fruits and vegetables of the highest quality and freshness during our summer farm season. To receive an email when the sign-up period begins, please subscribe to our email list. Last year Riverhill launched an initiative to try and address the food needs of low income families and individuals in our community. Along with being approved by the State of California to accept SNAP benefits (food stamps) at our farm stand, we wanted to take specific steps to get fresh, nutritious food to where it is most needed. To that end Alan Haight approached the Interfaith Food Ministry about the possibility of providing weekly, consistent and planned amounts to help feed Nevada County’s food insecure. As a farm growing healthy food, we felt that was the least we can do for our community. Interfaith was very supportive of the idea and we reached out to the community to support our efforts, and you responded with incredible generosity! By the end of the year Interfaith was able to purchase over $10,000 in produce at wholesale prices from Riverhill. This meant that over 3,400 pound of tomatoes and nearly 900 heads of lettuce (plus many other kinds of vegetables) went to some of the people who might not have been able to access the kind of produce so many of us take for granted. This year we know that the need still exists, and we want to keep trying to fill it. What can you do to help? It’s simple. Join with us to make this a reality. The amount you choose to contribute to this initiative will be donated to the Interfaith Food Ministry. Every single tax-deductible dollar you donate will be used to buy fresh, nutritious produce from Riverhill Farm at wholesale prices and will be distributed three times weekly during the farm season through their established food distribution system. You can adopt a plant, adopt a row, adopt a bed, or adopt a field, and anyway you choose to participate will make a difference. Subscribe to receive our weekly farmstand and farmers' market produce availability list, and to get seasonal updates about our farm.